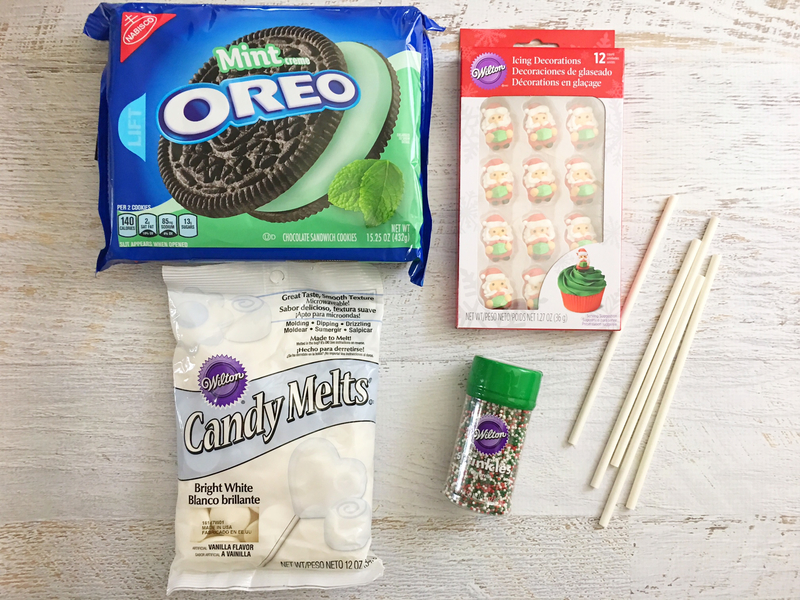 I love making seasonal treats for the holiday season. It’s fun to make a red and green mess in the kitchen and invite the kids to join in. However, oftentimes our schedules become more chaotic this time of the year and it’s hard to bake. If you’re anything like me too, the stress of perfectly baked cookies is too much pressure. 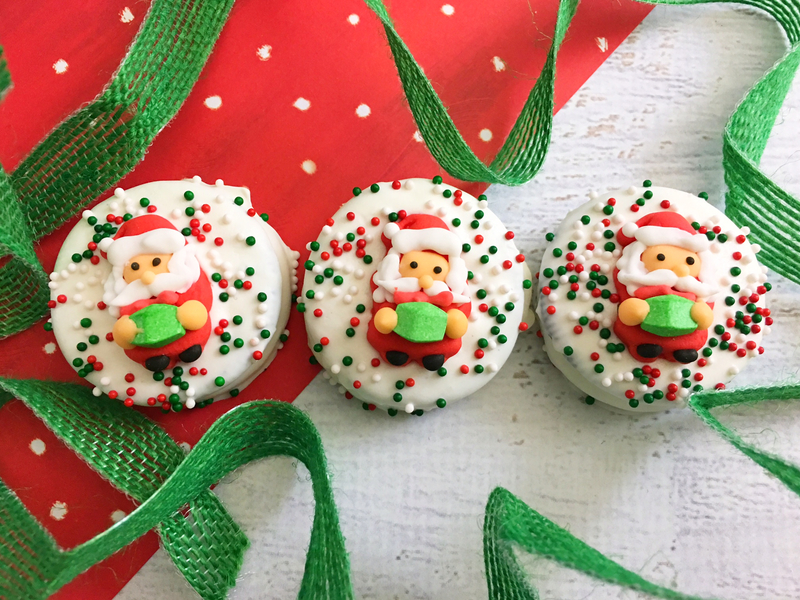 These Easy Santa Oreo Christmas Cookies take out the guesswork! They are simple, adorable and perfect for Christmas. My son loves to help dip cookies and nibble on a few Oreos in the process. 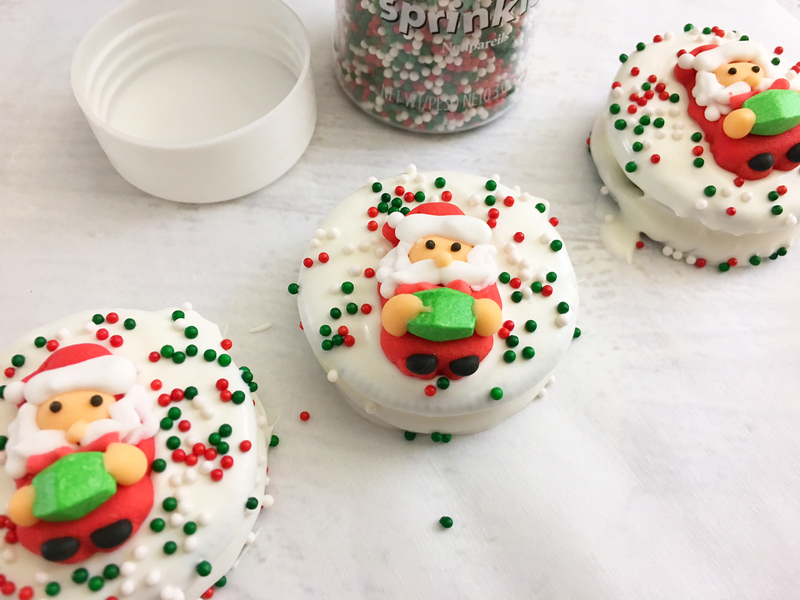 You can find the candy topper at a local craft store or order from Amazon – like these candy canes, Santa with reindeer and ornaments. Your guests will be so impressed by the finished look and you never even turned on your oven. They’ll become your new favorite Christmas cookies. Melt your white chocolate candy in the microwave. 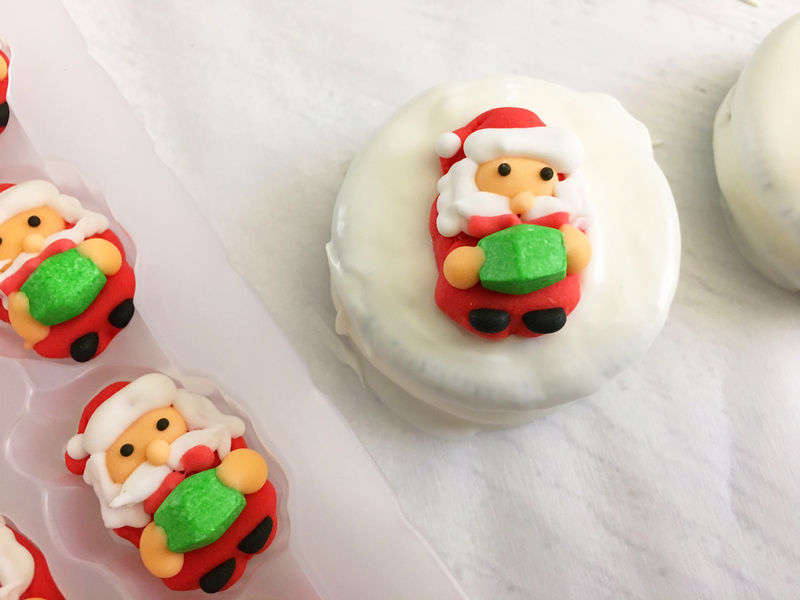 Place on parchment paper and add your Santa. Let the kids top with sprinkles. Serve at your holiday party – perfect with hot chocolate! Empty your bag of bright white candy melts into a small microwave safe bowl and heat on 50% power for 3 to 4 minutes, stirring every 30 seconds until melted. 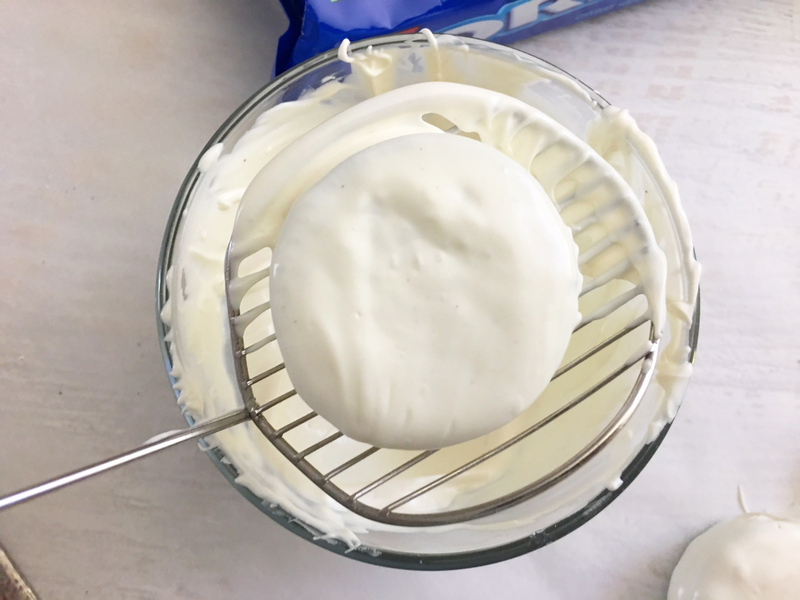 Dunk one Oreo into the melted chocolate at a time, remove with a fork or the Wilton slotted decorating spoon and let any excess chocolate drop off. Set your chocolate covered cookies onto a piece of parchment paper. 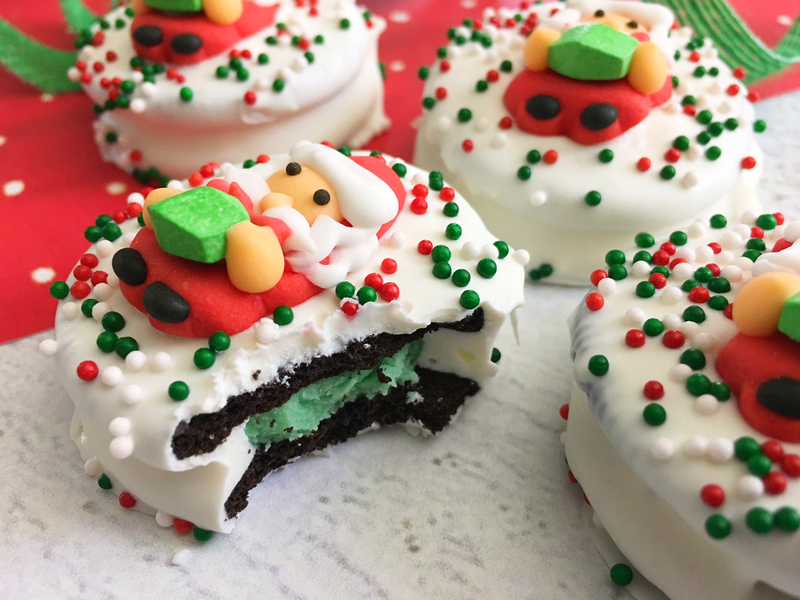 Place a Santa Clause candy onto the center of each chocolate covered Oreo and top with sprinkles. Let your chocolate harden for about 30 minutes and enjoy. Do your kids love helping in the kitchen during the holidays? Don’t forget to order your holiday cards too! 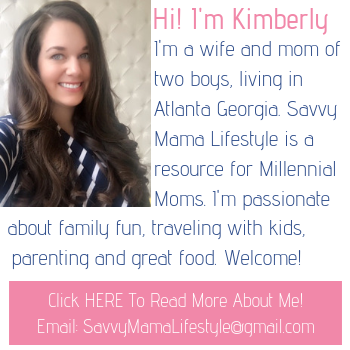 See how to create beautiful cards online.